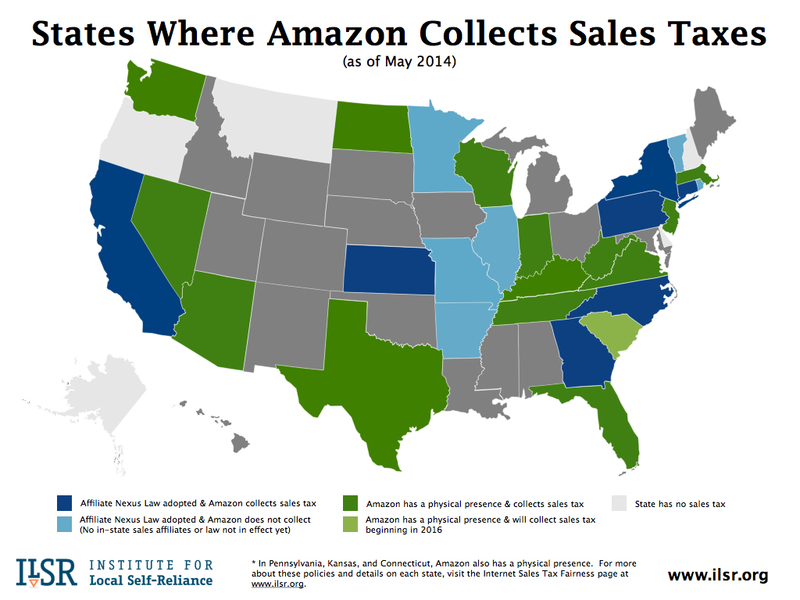 A new study published last month by researchers at Ohio State University Fisher College of Business found that finally requiring online retailer Amazon to pay state and local sales taxes in some jurisdictions results in a two percent shift in purchases back to local “brick and mortar” stores. The study confirms several things about the effects of such taxes even at the margins. One of my ongoing challenges during a four-decade career in community marketing representing three different areas was trying to help those in local government understand that increasing a sales tax, even by a point, is not free money. Many elected officials were quick to grasp that at the margins even a one point increase has consequences. It was the professional administrators preoccupied with only “pie-slicing” who were often the thickest. Maybe price elasticity isn’t taught in public administration or public policy schools. One manger even blew off the $40 million my organization spearheaded in annual tax revenue for local governments at the time by quipping that his job was only to worry about how it gets spent. He went on to say to a room full of onlookers that revenue is generated only when elected officials increase the rate of taxation. This man was the quintessential poster child for why a fifth of small enterprises obsess about taxes and ridicule peers who support increases even when assured the expenditure will be used to offset any impact. When I retired almost five years ago, a friend and former elected official suggested to the Sanford School of Public Policy at Duke here in Durham and the Institute of Government in nearby Chapel Hill that they seek my pro bono advice on how to better integrate revenue-generation in curriculums, but there was no response. A momentary breakthrough in Durham, North Carolina, the last stop in my now-concluded career was when the DMO there commissioned for the benefit of local and state officials an economist to compute the impact of sales taxes on lodging, retail, foodservice, transportation and entertainment, all industries in the tourism sector. It was beneficial and hailed as a best practice. Some took note of recommendations on how to offset such increases. But it was not enough to relieve the preoccupation by some elected officials and administrators with budget pie-slicing, a distraction from what should be an equal concern with revenue-generation and cost-benefit metrics. Of course, there are also a few surprising enablers. Ironically, the very businesses who oppose levying a tax on their own customers are often the most engaged in pushing for government incentives or tax breaks or even increased taxes to be levied on some other businesses but for their benefit. Too often the governments paying heed to these requests can’t seem to be bothered to detail stipulations to fully benefit the local economy and ensure that these breaks aren’t used to displace business from existing concerns. So subsidized businesses often seem to be invested instead in securing non-local vendors or formula stores that will hollow out the very local, independent concerns that make a place a place. This isn’t the only way local and state governments seem aloof to the plight of truly local businesses, most micro businesses or entire organic districts. Often without any strategic plan for enabling these place-based assets so critical to sense of place, they enact ordinances that often undermine them by driving up the cost of doing business such as parking and rental rates. Recent studies show that these factors are of far greater concern to truly local businesses, more than most concerns, especially regulations. Even leveling the playing field after granting 15 years of de facto tax advantages to online retailers, won’t be enough. While restoring tax coffers, the change has ten times the benefit to other online retailers than it will to local “brick and mortar” stores. Local governments are the beneficiaries of local, independent businesses because when leveraged by community marketing they are far better for visitor-centric economic and cultural development than formula stores, but their ecosystem is oh so fragile. This is why it is so bewildering when those in communities such Durham where sense of place still thrives, are so oblivious to the need for indepth strategic plans to guide the nurturing of pillars such as urban forest, local-independent retail, wayfinding and general upkeep. One was done here for the cultural aspect at the insistence of Durham’s DMO when a new tax on visitor businesses was sought. But plans, of course, amount to nothing without aggressive, energetic and disciplined long-term execution. Well-meaning elected officials need to connect the dots for themselves and administrators between these factors, revenue optimization and quality and sense of place – before it is too late.